The Houla massacre has totally eclipsed UN-Arab League envoy Kofi Annan’s talks today with Syrian President Bashar al-Assad in Damascus. Jihad el-Khazen, a renowned and veteran Arab journalist who is usually softspoken, says Houla marks the end of Assad. “There are bodies of 35-to-50 children who were either shot or knifed to death,” the former editor-in-chief of the Saudi-owned pan-Arab dailies Asharq Alawsat and al-Hayat writes today in his column for the latter. “I don’t see the outside world, whether Arab or European, remaining mum this time. Public opinion wants more than words from leaders. “I can see two possibilities, but not a third: Either the regime disappearing by international consensus à la Yemen or an open-ended civil war. Long term, I frankly can’t see Dr. Bashar al-Assad remaining as president. 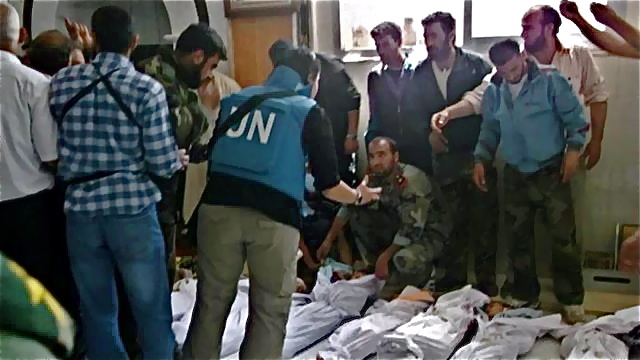 In New York, Human Rights Watch said Annan should push Syria’s government to allow the UN-appointed Commission of Inquiry access into the country to investigate the killing of at least 108 Houla residents. The Syrian government has so far refused entry to the UN-mandated commission. Human Rights Watch also reiterated its call to the UN Security Council to refer the situation in Syria to the International Criminal Court (ICC). Survivors of the Houla attack have meantime spoken to the BBC, which published their accounts on its website. "The shabiha militias attacked the houses. They had no mercy. We took pictures of children, under 10 years [old], their hands tied, and shot at close-range, from 10cm, just 10cm. By knife they cut their neck, not exactly all his neck, but they make a hole in the neck, a hole in his eyes." "We were in the house, they went in, the Shabiha and security, they went in with Kalashnikovs and automatic rifles. We asked them what was going on and they told us to go inside. We said: 'What is it? What do you want?’ They said: 'Take everything out, whatever you are hiding,' and we told them: 'We are not hiding anything'. They took us to a room, and hit my father on the head with the back of a rifle and shot him straight in the chin. They took us inside and told us to gather in the corner of the room. A man started shooting in the air so we all hid behind my mother. We were about 15 people. Then they opened fire. After they shot us they started to step on us, and one of the men asked the other to check whether we were all dead. Then they went outside and started shooting in the air. We were eight siblings, including myself, and my sister-in-law and her son -- she was also six months pregnant. With us as well were my father, my uncle's wife and her daughter, as well as our neighbor and her three kids. My aunt and her two daughters -- one of them was only injured and she's here with me -- she is one month old, the other one died. We were all in the house. I survived with my mother and the one-month-old girl and my sister. They shot at us but we survived. What's going to happen to us? When we hear that the army and the security is coming we start running in the streets, we are afraid they would repeat what they did to us the other day. "We were opening our houses to them, we thought they were the army, and that they were doing inspections. One of them told me: 'Go back inside, your turn is next'. I was with my husband and kids. So I got my husband's army service card, I thought maybe they would not bother with us when they see it. But I only survived because one of them shot another by mistake, and he yelled: 'I need help, Fakher was shot'. That kept them busy while we ran away, bullets were flying around us, from the army and the shabiha." "When they opened the door, I was still with them in the room. I was standing behind the door of the living room. They took my brothers outside, and I hid on the attic. All I could hear was gunfire; it felt like the whole house was shaking. I opened the door, and I saw bodies, I couldn't recognize my kids from my brothers. It was indescribable. I have three children; I lost three children. I am shaking, I'm shaking as I'm speaking to you." "Rockets and bombardments everywhere … I don't have any news of my own family. Why are you not intervening? All the corpses are piling up. If it were a foreign country all countries would have intervened. Come and remove all these corpses from the streets." "There were two massacres. The first happened on the Sadd road and started at around 2:30pm on Friday afternoon. The second massacre happened around 11pm, on the road at the main entrance of Taldou, facing the military security point. On the Fulla-Taldou road -- 500m to 700m from Fulla village -- this village is supportive of the regime -- a van, two pickup trucks and a group of motorcycles came from that village. They entered the neighborhood, and met a shepherd at the entrance. His name is Mahmoud al-Kurdi, and he was with his daughter-in-law and his four grandsons. They shot them, killing them all except the daughter-in-law. She was shot in the thigh and belly area but she is still alive. They then entered the house of Samir Abdul Razaq. He was killed with his children -- Sawsan, Houda, Jouzila and Nada. And his daughter-in-law Halloum El Khlaf, six months pregnant, with her son Ala'a Abdul Razaq, and Samir's sister-in-law Khaloud El Khalaf, and her daughter, Rahaf Al Hussein -- but her daughter Zahra Al Hussein was shot twice but survived. Samir's wife was hit with the back of the rifles but she fainted and is now still alive. Also among the victims in this house were four kids whose father is Fadi al-Kurdi. The next house they entered was the house of Qutayba Abdul Razaq, he survived and his one-year-old daughter was injured. He lost his wife and five of his children. All of those I'm counting died by gunshots, direct fire. They were gathered in one room and shot. There was one kid however whose head was skinned with a knife. The knife was found among the bodies and we have its picture. The third house belongs to Nidal Abdul Razaq, his wife and four of his children were killed, and he and one of his children are still alive. Adel Abdul Razaq -- his whole family, a wife and six children. Mustafa Abdul Razaq was killed with his four daughters, his wife and his daughter in law. Ayman Abdul Razaq -- all of his six children were killed as was his wife, one of the children was disabled. Abdul Khalek Abdul Razaq -- his wife and daughter survived gunshots but he lost six other children and his daughter-in-law and her three children. Abdul Rahman Abdul Razaq lost his wife, his five daughters and 11 grandchildren as well as his six daughters-in-law and four of his sons. He still has two who are still alive; one is called Firas and the other Rateb. This massacre was of 27 people in the same room. 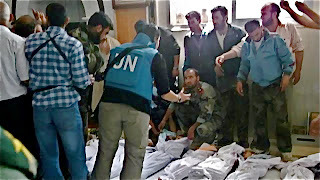 Also killed in the massacre were Yaacoub Hussein Abdul Razaq, Mohammad Shafiq Abdul Razaq, Mohammad Abbara and his daughter Amina and her family of seven."